People who experience mental illness, or care for someone that does, can be faced with a range of emotional or physical challenges on a daily basis. Some of these can be obvious, but one area that receives relatively little attention is the need to ensure that the person is eating and drinking safely. co-existing physical or cognitive conditions alongside their mental health needs. There are many reasons why mental health patients might struggle at mealtimes, including changes in behaviour around food, side effects of medication and poor oral health. Anti-psychotic medications can produce unwanted side effects, including a dry mouth or changes in muscle function. This can make chewing and binding food together more challenging, and this can influence what foods are safe for the person to eat. People with co-existing medical conditions affecting their motor skills, such as cerebral palsy, may struggle to physically chew and swallow some foods, which means they may risk choking if left to eat unsupervised. Equally, some people with a learning disability find it difficult to monitor how much food they are putting into their mouths – or whether they’ve finished swallowing the previous mouthful – and this can be dangerous if left unchecked. Dementia can affect a person’s behavior, memory and perceptual awareness, making it harder for them to recognize food and utensils, keep track of the task of eating or judge their speed - and any associated language difficulties can impact on their ability to describe a problem or follow mealtime instructions. Finally, there may also be environmental factors affecting safety at mealtimes, for example, the visibility of second helpings of food may encourage people to rush their meal and leave the dining table before they have finished chewing. Many of these environmental issues can be avoided by observation of behavior patterns and simple changes in mealtime practice, for example ensuring that second helpings of food are out of sight. Sometimes, despite our best efforts, it can be difficult to spot a person who is having problems with eating and drinking. So what are the warning signs to look out for? Unsurprisingly, most of them occur during or just after mealtimes. In more serious cases, you might notice a person physically struggling with eating and chewing – perhaps coughing or appearing sweaty or teary-eyed during their meal. There may be changes in breathing or colour and they may appear panicked or apprehensive, with a voice that sounds ‘wet’ or gargled when they speak. Food may escape from the mouth, or they may overload their cutlery and eat too quickly. Over a longer period, you may notice the person avoiding certain food textures, weight loss, dehydration or recurrent chest infections, some of which can develop into a life-threatening pneumonia. These warning signs can be surprisingly subtle and it really pays to take time observing a person eating in order to pick up on the clues. Checking a person’s dental hygiene is crucial – poor oral health is common in this patient group, and painful or missing teeth can make mealtimes both unpleasant and risky, especially when the person is presented with foods requiring chewing, even when that food might be described as a ‘soft’ wrap. Posture is also important for safe eating; if a person is slumped in their chair then eating and swallowing will be much harder and this could lead to increased risk, so making sure patients are upright and alert when meals are served can really help. 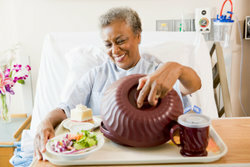 For people struggling with motor skills, using normal cutlery can be a challenge, but providing adapted cutlery, a plate that has a lipped edge, or placing their plate on a non-slip mat, can preserve their independence and dignity while making it safer to eat, and this is where advice from occupational therapy colleagues proves invaluable. For some people, the texture of a ‘normal’ diet can simply present too many risks, in which case, specific advice will be given about making changes to the texture or consistency of meals to reduce the risk of choking and other complications. Though it will sometimes be necessary to make these changes to texture, it’s important to try to maintain the look of a normal diet, as this can preserve the person’s enjoyment of food, prepares the mind and body for a meal, and helps people with perceptual or memory difficulties recognize what they are eating. Although it’s the speech and language therapist’s job to recommend whether their patient needs a ‘texture-modified’ diet, everyone who cares for someone with mental illness can benefit from being aware of the risks around eating and some simple ways of improving the person’s mealtime experience. After all, it’s not just a person’s nutrition that benefits from eating a safe and healthy diet, but also their quality of life.